Jeong Won Lee crafts her groups of vessels from cast porcelain. With their captivating, lightweight cheerfulness, many of them almost seem too beautiful to be used. Most of them are based on simple basic shapes, with their outsides quite often featuring protruding surfaces, dots and lines, as if this ceramist had pulled elastic films over precision-shaped elements. The references to sculptures, as well as to Lucio Fontana’s Tagli – paintings with slashed canvases –, are obvious. What Jeong Won Lee creates with these elements, however, is an eminently functional haptic feel, as well as a particularly charming sight for the beholder’s eye. Yet her creations are also deeply rooted in tradition: using glazes ranging from pink to ice-blue and turquoise, Lee re-interprets white Korean Joseon ware for contemporary porcelain art. The prices range between 500 and 5000 euros. Cup series, 2013. 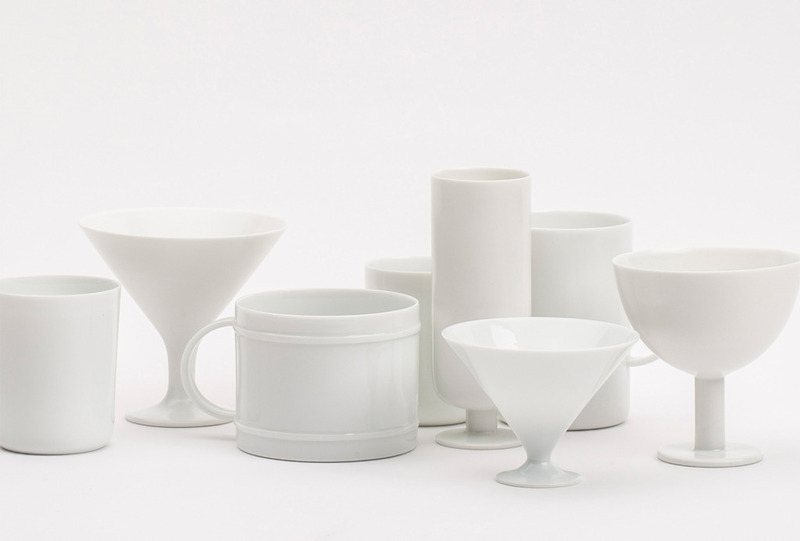 White porcelain, slip casting, transparent glaze, various sizes. Vessels Re-Formed, 2013. White porcelain, 11 × 22 cm.